HaGaon HaRav Ze’ev Dov Slonim ZT”L was niftar on Monday morning 14 Teves in Yerushalayim. The niftar was the official Rav of the Center of Jerusalem as well as a member of the Chabad Beis Din in Eretz Yisrael. Rav Slonim was born in Jerusalem in 5694 to Rabbi Yehuda Leib Slonim ZT”L and he was named after his paternal grandfather, Rav Ze’ev Dov Slonim ZT”L, rav of the kehillas Chabad in Hebron. 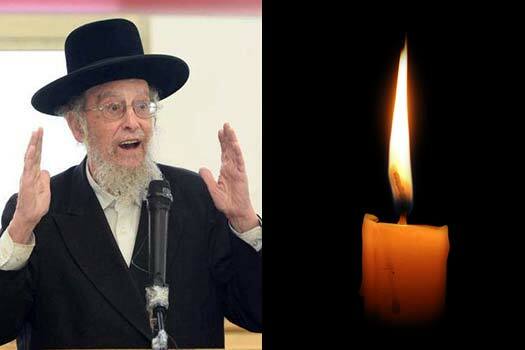 His father was the gabbai of the Chabad Shul in Meah Shearim and a member of Chevra Kadisha Chassidim in Jerusalem. The rav studied in Mir, a talmid of the Mashgiach HaRav Yechezkel Levinstein ZT”L. he married Mrs. Gitel Leah (bas Rav Yisrael) Feldman. He was appointed as the rav of the center of Yerushalayim in 5730. The niftar authored a number of seforim including Shu’t Shaare Halacha. His children include Rav Aharon (Chabad shaliach in Binghamton, NY), Rav Yosef Yitzchak (Chabad shaliach to the center of Jerusalem), Rav Schneur Zalman (Chabad shaliach to San Paulo, Brazil), Rav Baruch (Rav of Chabad in Modi’in), Rav Tzvi Hirsch Chaim (Chabad shaliach in Mitzpei Ramon), Rav Yaakov (Chabad shaliach in Givat Mordechai & Ramat Beit HaKerem, Jerusalem), and his daughter Hadassah and her husband Rav Menachem Mendel of Jerusalem. The levaya began at 2:00pm from his home at 74 HaNevi’im Street via the Nachlat Shiva Shul, Chabad Meah Shearim, and to the Chabad section on Har HaZeisim.